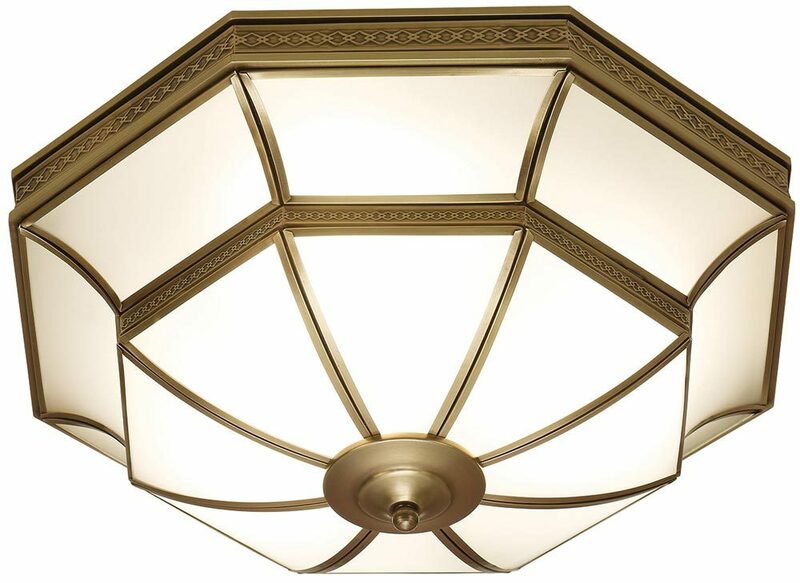 The Balfour frosted glass Art Deco style flush 4 light in antique brass features solid brass embossed trim and curved frosted glass, a wonderful bright and airy ceiling light in the period style. With a concealed flush mount supporting an inverted octagonal curved glass shade. The rim is decorated with an antique brass panel, embossed with a geometric design. The shade is a particular feature, with concave curved panels at the top and convex panels below. Each glass panel is trimmed at the edge in antique brass and features a lower finial. A lovely geometric design typical of the Art Deco period that will add a touch of class to any room. At just 21cm high, this is perfect lighting for rooms with a lower ceiling. This brass metalwork on this flush light has been lacquered to ensure that the finish lasts without polishing. It is important not to use any abrasive or chemical cleaners as this will damage the finish. A light dusting or cleaning with a damp cloth is all that is required to maintain its good looks. The Balfour frosted glass Art Deco style flush 4 light in antique brass, part of the Rochamp collection of solid brass light fittings. Made entirely by hand using traditional sand casting techniques passed down through generations. The parts are then polished before being patinated to give an aged look.